“America’s Toughest Road Marathon” is in the books! For me Blue Ridge Marathon was marathon #14. And, while it was definitely my toughest, most challenging marathon (and with my worst time by 24 minutes), it was also the marathon where I felt the strongest. It was one of those marathons that every runner dreams about having – where the marathon stars align. What’s the background? 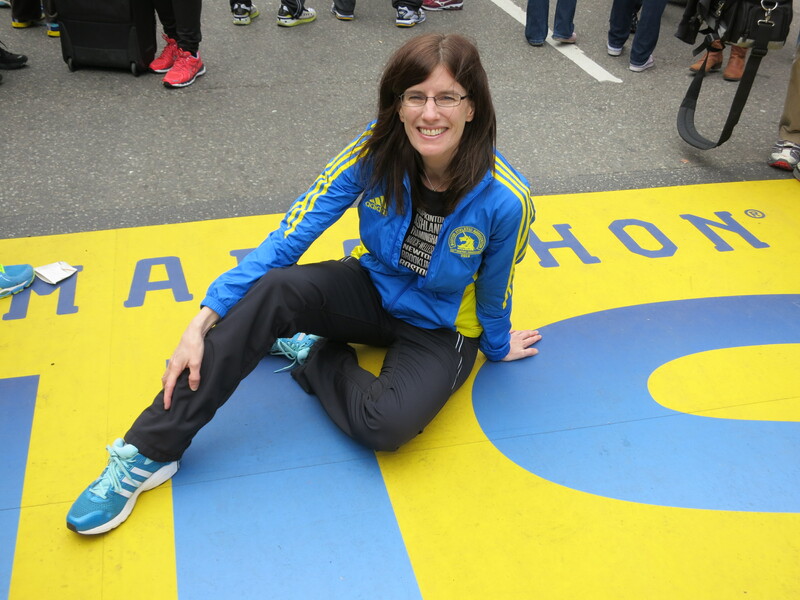 I’ve been plagued with left tibial stress fractures and stress reactions since shortly after Boston 2013. Since then, I’ve felt recovered enough to run one marathon (Twin Cities 2014), but the stress fracture returned after that. I decided on this marathon because I wanted to run a marathon that was something different – a challenge and one that would force me to approach the marathon differently and not think about speed and qualifying for Boston. This definitely fit the bill. With just under 7500 feet of elevation change and a climb up and down 3 mountains, survival, not a BQ, would be my focus. How did I train? I’m from Minnesota. We don’t have much in the way of hills near me. Certainly nothing that would compare to the “hills” I’d be running up in Roanoke. Training with hills was even more complicated by the fact that I was training through a Minnesota winter. Although we got lucky and didn’t have a super snowy winter, we did have some ultra cold, nasty windy days that all seemed to fall on Saturdays – long run day. So in terms of hill training, I didn’t do much. My hilliest training run was 17 miler with 1390 feet of elevation gain. I followed a Pfitz 16 week training plan, so I did manage to get in three 20 milers. I also did a lot more cycling (on the trainer and fat bike) than I normally do. And, of course, I religiously did my core work (which I do regularly now because I’m convinced that is a big part of the reason that I have suffered so many stress fractures). The “speed work” I did was pretty laughable – since I was just building back up after an injury my paces were so slow compared to my normal marathon speed paces. But I didn’t really care – I was just SO happy to be healthy and training for a marathon. So going in to Blue Ridge, I felt trained to cover the distance, but not trained for the hills/mountains. What was my race plan? Run the entire marathon by feel. Turn the garmin on timer and don’t look at the pace per miles or average pace. Just run it so I never feel like I’m overexerting myself. Walk when necessary to maintain this feeling. Enjoy the gorgeous scenery. Enjoy the perks along the race (mimosas at mile 13; champagne on top of Peakwood – mountain #3). Take tons of photos. Stop and chat with my fans (my fiance Scott! How hilly was it? The photos don’t capture just how steep and long the hills actually were. There were many parts where EVERYONE around me was walking. It just didn’t make any sense to run up the steep inclines because they were so steep that power walking got you there at just about the same time (but saved a lot of energy). And the hills were just short little inclines. They went on and on and on. The three mountains were Roanoke Mountain, Mill Mountain and Peakwood. Even after we were done with the 3 mountains, there were rolling hills and a few REALLY steep ones. I ran up what I could – at a very slow pace – and power walked up what I couldn’t run. On the downhills, I ran controlled with short strides. So many people were barrelling down the mountain on the downhills, super fast and with long, pounding strides. By the end of the race, I was passing many of them (plus I bet their quads are wrecked today – I’m sore, but not crazy sore). How did it feel? FABULOUS. Seriously. The whole marathon felt freaking awesome. I have never felt so strong and amazing in any of my previous 13 marathons, or in any training run. I felt great aerobically (the walking that I did during it, and the stopping to talk to Scott, take pictures and pee – I stopped 7 times just to pee – surely helped me feel great aerobically). Each time I saw Scott, he seemed amazed when I said that I was feeling great. My “normal” marathon race execution is this: go out at BQ pace. Feel “ok” for 10 – 15 miles. Blow up. Feel like crap and then walk/jog/cry/swear the remaining miles. This marathon was simply amazing – like a dream. In the back of my mind, I was wondering when I would fall apart and hit the wall. It never happened. Miles 23 – 24.5 I did start feeling tired, but I got a burst of energy at 24.5 and finished strong. I actually picked the pace up and “sprinted” the last couple blocks to the finish line. It was so crazy how good I felt during the entire race! What were the stats? 4:51:26 (moving time was 4:44 – I stopped to chat, take pics and pee a lot!) I was 56th female and 9th in my age group. How was Roanoke? Lovely. Great restaurants, lots of good craft beer, friendly people, gorgeous scenery and tons to do for the outdoor lover and adventure seeker. Scott and I arrived in Roanoke early so that he could participate in Roanoke’s inaugural hill week cycle camp for grown ups. He loved it – he got tons of miles (and hills) in on his road bike to prep him for Leadville 100 mtb and met friendly, fun cyclists who made sure that we had a great time in Roanoke. For me, Blue Ridge Marathon isn’t just a bucket list marathon. I’ll be back to do it again!